I prefer spring rolls with only a few ingredients. What I like most about making them, however, is the versatility. There is an endless assortment of ingredients which can be used for the filling. I, myself, am partial to tofu and shrimp but in the past I have had many traditional and not so traditional combinations of meat and vegetables, the most notable of which was fried rice and raisins. This recipe is also a non-traditional twist but it incorporates flavors that are common in east asian cooking. In particular, coconut, fish sauce, and chili flakes. 1. Whisk together fish sauce, red wine, olive oil, and chili flakes. Set this marinade aside. 2. Season shrimp lightly with salt and ground black pepper. 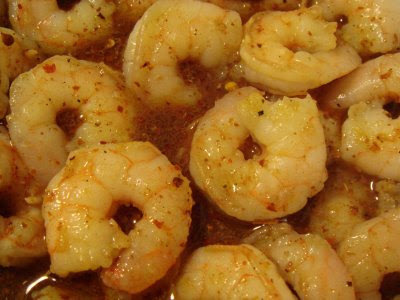 In a heavy skillet over medium high heat, cook shrimp for 1 to 2 minutes on each side until cooked through. Transfer to marinade, mix well and set aside. a. 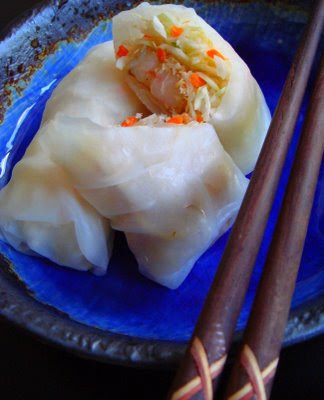 Working one at a time, soak a rice paper sheet in warm water until soft and pliable. Set on a paper towel or tea cloth. b. Place 2 tablespoon of cabbage on the end closest to you. To that, add a teaspoon of toasted shredded coconut and finally two or three shrimp. c. Fold the vertical sides about 1 inch inwards, then pull the horizontal end closet to you up and over the filling. Continue rolling up and away from you until you reach the other edge. d. Continue steps a. to c. until all the filling ingredients have been used up. 4. Any left over marinade can be used as a dipping sauce. 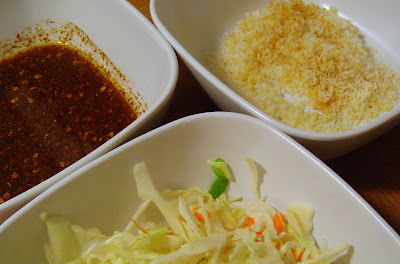 Clockwise from top right: toasted shredded coconut, shredded cabbage, marinade. Thanks Gail! I hope you enjoy this flavor combination. These look so good! 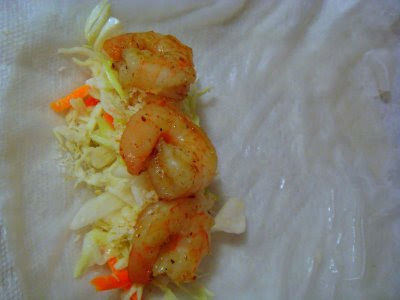 And it's a really original take on what to do with the shrimp for a fresh spring roll. Lovely! Now, that's what I call healthy!